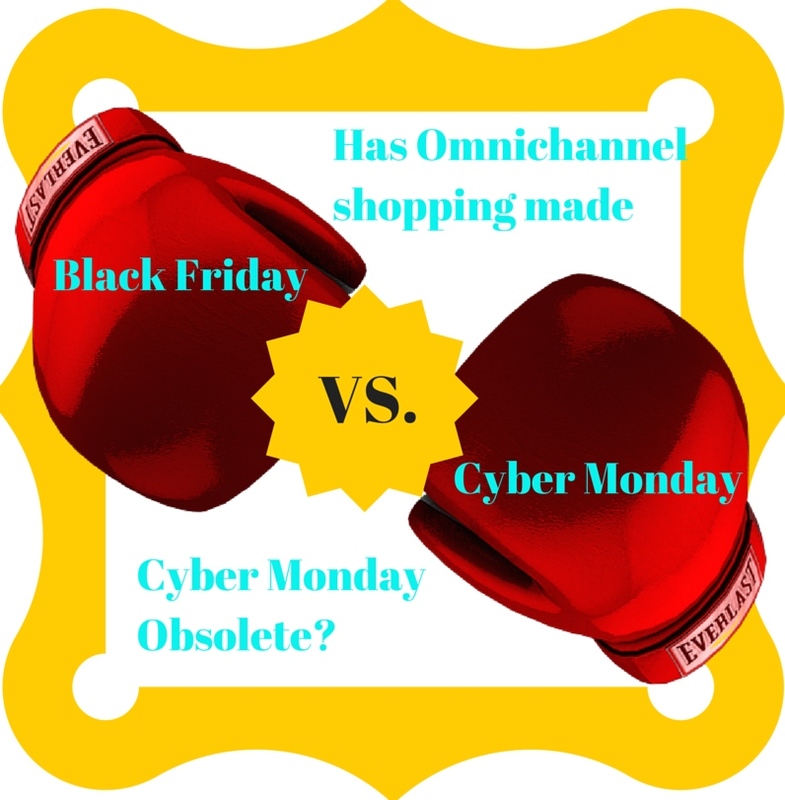 Has Omnichannel Shopping Made Cyber Monday Obsolete? In order to cultivate successful omnichannel shopping experiences, retailers and brands have spent the last year (or more) working to connect their brick and mortar, online, and mobile shopping platforms. This push for connectivity has caused many companies to offer their Black Friday deals online, as well as in store, for the first time and led to articles like this one in Forbes predicting an imminent end to Cyber Monday, but we have to disagree with that prediction. Despite the evolution of Black Friday to include online deals, Cyber Monday can still be an effective tactic to drive more sales and higher engagement than Black Friday alone. Brands and retailers can add value by offering divergent sales on each day. A great example of this is the clever sales strategy utilized by Urban Outfitters this year. Urban Outfitters' Black Friday and Cyber Monday sales strategy is a great example of a thoughtful, multilayered incentive plan that drives sales online, in stores, and also increases engagement. An email on Thanksgiving day to thank their customers also announced their brick and mortar Black Friday discount: an extra 50% off sale items in store. UO was also able to inform me that "my" store location would be opening early, at 5 am, to encourage in-store shopping. For those who weren't interested, or willing, to brave the retail firestorm of Black Friday. UO sent out a second email on Friday morning announcing that they would also be offering an extra 25% off sale items on their website. Many retailers and brands offered consistent sale prices throughout the week of Thanksgiving, but UO created an entirely new offer to entice customers for Cyber Monday while simultaneously boosting mobile engagement. UO offered shoppers early access to their Cyber Monday sale through their shopping app, and creating an account was required. The Cyber Monday sale was different than their Black Friday offer: shoppers could get $50 off their purchase of $150, $25 of their purchase of $100, or $15 off their purchase of $75. 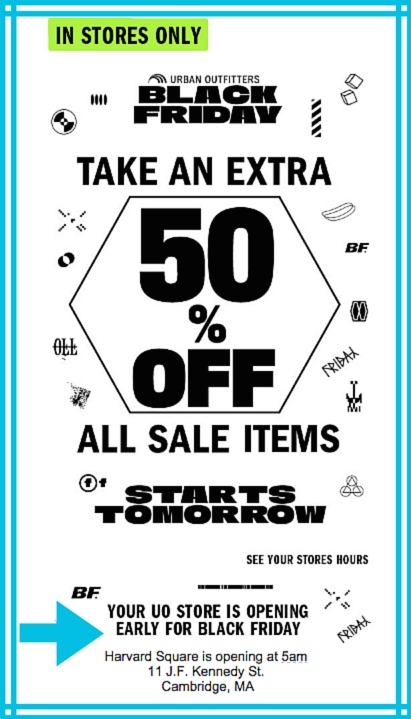 This is a killer sales strategy for several reasons: by offering 50% off sale in stores and 25% off sale online, UO is giving those shoppers who are willing to shop in store the day after thanksgiving a big reward, but their 25% off sale online prevents them from losing out on ecommerce-only Black Friday dealhunters. 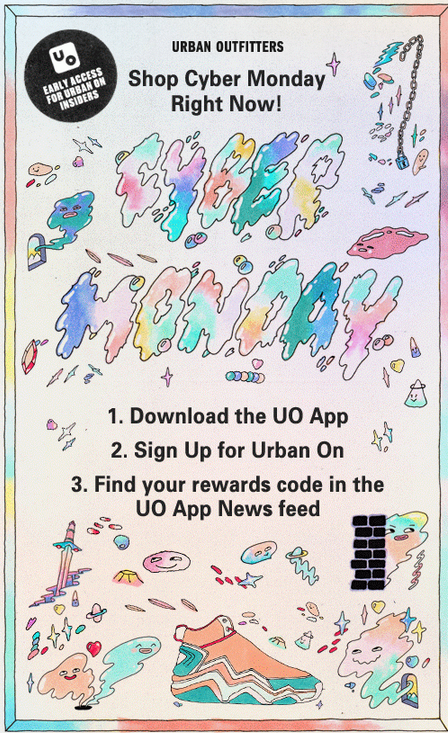 Giving shoppers an incentive to download the UO shopping app is another clever tactic because it gives them the ability to remarket to those shoppers down the line by sending push notifications for new products and additional sales. The last thing to note about UO's holiday sales strategy is the fact that they offered diverse types of discounts that appeal to different types of consumers: offering a further discount off sale prices will attract consumers who are looking for the lowest possible prices, while offering a discount like $50 off a purchase of $150 is ideal for the more discerning shopper who is only interested in newer seasonal styles. By including both offers, UO is appealing to, and engaging, a wider audience. UO's strategy should serve as a guide for other brands and retailers: it's an effective way to make the most of Black Friday and Cyber Monday while simultaneously engaging customers in an omnichannel-friendly way.